On a romantic getaway in Alaska, Asher & Emmett will risk it all to save others when an earthquake hits and turns their paradise into a disaster zone. 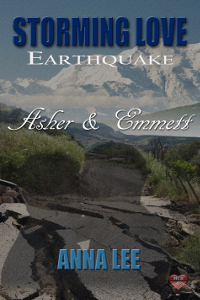 Celebrating their fifth anniversary, Asher and Emmett are on a romantic getaway in a cabin in Alaska. They have plans to adopt when they return home. But their paradise is destroyed when a huge earthquakes hits. Being a firefighter and a paramedic, both men put themselves at risk to save others when the tragedy strikes. Will they be able to make it home to start a family?